Brazil’s elected leader, Dilma Rousseff, was brought down by a media boycott and businessmen who avoided paying taxes to harm the public purse, Luiz Inacio Lula da Silva, Brazil’s former president, told the Entrevista program on RT Spanish. RT: Thank you very much, Mr. President, for finding the time to meet with RT. Luiz Inacio Lula da Silva: I would also like to thank the international media for its interest in Brazil and the current political discussion with respect to the impeachment [of President Dilma Rousseff]. I’m very happy that I’ll have a chance to tell you what I think about the things that are happening, or have happened, in Brazil, or may happen in the future. I think Brazilian democracy is very young; it is only 31 years old. This is the longest period of democracy in the 500 years of Brazilian history. Yet the conservatives thought that 31 years is enough and decided to overthrow democracy, which they did. By overthrowing democracy, these people denigrated Brazil in the eyes of the world, because the world expected Brazil to do much better. RT: A little over a week ago, we saw you standing behind President Dilma Rousseff. 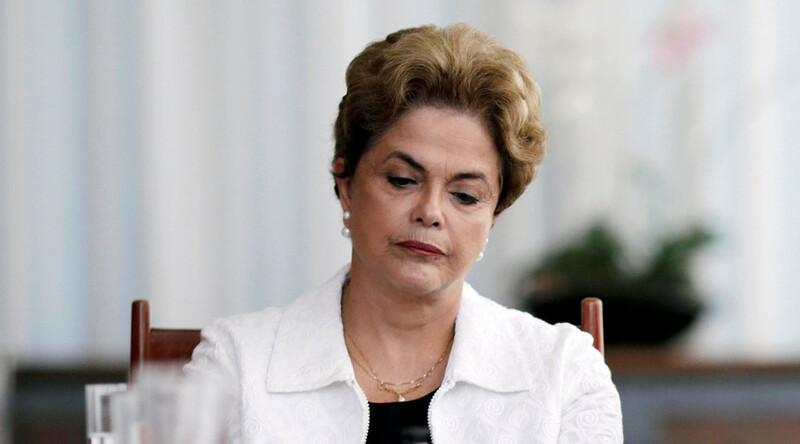 You were backing her at a difficult time – difficult for her, for Brazil, and for your party. Can you tell us how you felt on the day Dilma was suspended? L: Frankly, I didn’t want to get involved. I didn’t want to be in that picture, because I think it was cruel. It was basically a crime against Brazilian democracy when Dilma had to step down before the end of her term. 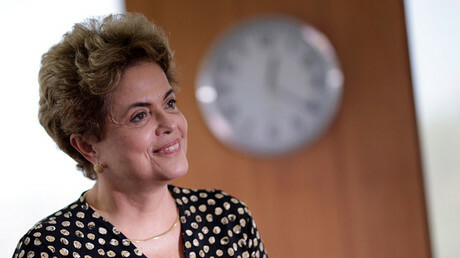 I stepped down five years ago, in 2010, at a wonderful moment when Dilma was elected president of the Republic. And I felt very bitter on the day of her impeachment. It was a very sad day for me. It was not just about the president resigning early. Our dream plan collapsed; the plan for integrating society. The plan which showed the world that it is very easy to rule the country and address poverty issues when the needs of the poor are taken into account in the state budget, if you don’t consider it merely as a statistic or a social issue, but really think about people, human beings with rights and responsibilities. All this came tumbling down before my eyes. So I was very angry. And yet I was very calm, preparing for the future because I think that the people who support this plan will soon come back to power in Brazil. The poor people have barely learned to use social benefits, and somebody is already trying to pry them out of their hands. So, to me, frankly, it was a day of wrath. It was very hard on me, and I wish I could stay out of those events. I did what I did out of solidarity with Dilma. I didn’t want her to be alone at such a difficult time. I wanted to show to her opponents that the country would fight back. We have a long way to go before the people of Brazil can enjoy the same standard of living as many other countries around the world. RT: This was certainly a very powerful image, an image of unity. Curiously, your answer is very similar to what Rousseff herself told RT just on Thursday: that the situation is difficult but the fight has to go on. This process started, and it may take 180 days, six months, or less. 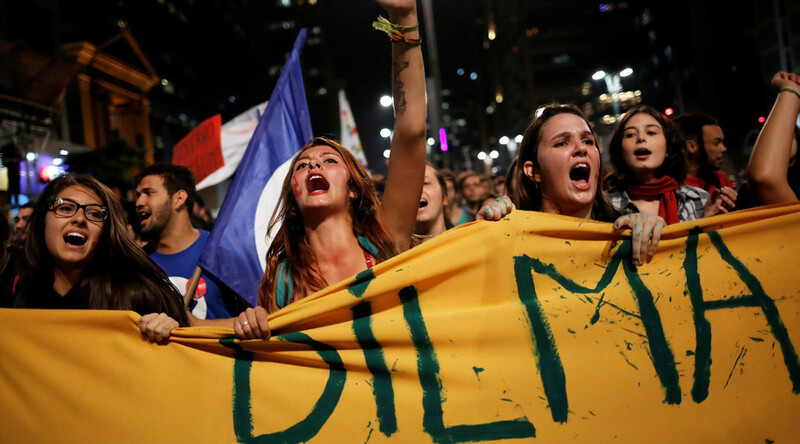 What are the legal mechanisms for reinstating Dilma? L: I think this is a mistake, misunderstanding – what the media say every day, and what the government does. What really happened in Brazil is the Chamber of Deputies initiated a process with the Congress, and we believe it was for purely political reasons, because there were no constitutional violations. The Senate voted in favor of allowing the impeachment process. What this means is that the Senate will now hear the charges brought against President Dilma. But there is no proof that she did anything illegal. Then there will be a vote. The government should have acted as an interim government, because in 20 days, or a month, or two or three months, there will be a vote, and senators may change their minds, and so the interim government will have to go, and the legitimate government will once again be in charge. So, I don’t think the interim government should act as if it were a permanent one, as if the impeachment has already taken place and Dilma has been stripped of presidency. This hasn’t happened yet. So, I think the interim government is abusing the power it received from the Senate. In other words, the Senate put the interim government in charge of the country while Dilma is suspended. It’s as if she is temporarily out of the country. But the interim government acts as if it was appointed permanently. It wants to replace all the ministers, and if the Senate votes for Dilma in three months, she will have to start from scratch. And the country can’t afford that. Also, I think this was a coup pulled off by the current government based on the Senate’s decision, and I think it will hurt our country immensely. I think we need two kinds of popular movements today: first, many people are ready to take to the streets, because the way the current government conducts itself has offended artists, intellectuals, union members, Afro-Brazilians, etc. I won’t make a judgment about it because it is up to the government to make this judgment. When I was president, I didn’t allow others to make judgments about the people I appointed as ministers. But I think the government is a very poor role model for the people. 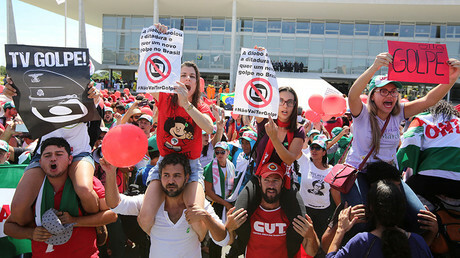 So we have to take to the streets and ask people to put pressure on the government, demanding that Dilma be reinstated. She may change the way she runs the country; she may present a new economic program to the people of Brazil and discuss it with senators. Basically, Dilma has to convince six senators to vote for her. I think it is quite possible. So, we will do our best to bring peace and democracy back to Brazil, and to have a directly elected government. If people are all in agreement, we will have a general election. We’ll convene a constituent assembly, which will vote for a political reform. In a word, we have our work cut out for us. One thing we can’t accept and agree to is that in the 21st century we have an illegitimate government in control of Brazil. RT: If I understand you correctly, this coup is directed not only against the President, but against the very vision she has promoted? L: I believe this is a coup directed against Brazil’s fledgling democracy. You can’t remove a president from power just because you don’t like her ideas and opinion polls suggest she’s not very popular. We need to learn to respect the will of the people of Brazil. The people had voted for Dilma, she had won an election, beating her opponent by a margin of 4 million votes. And even if she had beaten him by a single vote, she still would have been the elected head of state, according to the rules of democracy. The way I see it, Brazil’s business elites and media establishment have effectively denounced those rules. Democracy, in their understanding, is when they get to decide who gets to run the country and who should step down. I believe Dilma has been targeted by a clique of media heads and business people, who didn’t pay taxes to make the government collect less tax revenue. Besides, we also need to acknowledge that mistakes have been made, and those mistakes have hurt us. I am particularly referring to Dilma’s second presidential term. You see, we had won that election running on a specific agenda, but once we were in office, we started doing things we had promised not to do. This has affected the working people, and it has been very damaging for us. It was a disastrous mistake, and Dilma is aware of that. Once she is back in power, she will have to rectify it and promote her original agenda in order to be able to have a majority of Brazilians back her policies. RT: One way or another, Brazil needs a change, including a reform in the Worker’s Party that would enable the creation of an inclusive political movement, which would include, say, labor unions. Don’t we need a change to meet the needs of the people of Brazil? L: I believe a lot of things need to change in Brazil. First of all, we need radical political reform, which should be spearheaded by the National Congress. But given its present set-up, the Congress will do no such thing. So we need to convince the people of Brazil to have a referendum on electing a constituent assembly by popular vote in order to carry out political reform. You just can’t run the country the way the National Congress has been doing it, so that’s got to change. Secondly, we need the kind of economic policies that would encourage growth. We are going through a global crisis right now, but a large country such as Brazil should not be affected as much as it is, because we have a vast domestic market that is very strong, and we have enormous investment potential. The way things are today, the government is unable to collect taxes, and businesses are reluctant to invest in the economy for lack of political stability. Banks are similarly unwilling to invest and issue loans. Both the federal government and local governments don’t have the money to invest in the economy. So what we need to do is enable economic growth, and I believe that Brazil can do a lot by virtue of its sheer size. Let me give you an example. At the start of the global financial meltdown in 2007, the United States had a sovereign debt that amounted to 64.7 percent of its GDP. Today, it’s 105 percent. You see, they had to increase their sovereign debt so that the government would have the money to stimulate economic growth. We have a similar situation in Brazil. An economy our size could afford to have a sovereign debt of up to 65 percent, and that would not be a problem, as long as that money is invested in building infrastructure and creating facilities that would enable the economy to generate profit. What we shouldn’t do is use debt to finance government spending. But it should be used to invest in the economy and build things like motorways, railroads, airports and seaports. I believe that in a country where 35 percent of the people live below the poverty line, it is a mistake for the government to think those 35 percent are the only ones it should care for. We have proved that the poor are not the problem. Once we entitled poor people to minimum income, we saw an unprecedented surge in the standard of living in our country, never seen before in human history. Brazil provided a groundbreaking example for the world, a model for getting 36 million people out of poverty over an incredibly short period of time, and promoting some 40 million people to the middle class. RT: And the UN Food and Agriculture Organization (FAO) has acknowledged that achievement. L: Yes, FAO had to acknowledge it. I have delivered a lot of lectures in other countries, in Latin America and Africa, explaining that the best way to provide for the poor is to include them in your budget plans. That is, when drawing up a budget, you have to plan for part of it to be used for the poor. RT: Do you think that with the current interim government or a new neoliberal government all these social achievements might disappear? L: That is a possibility. Of course it is not so simple. But it could happen because if we follow their logic – and this has already been mentioned several times in the media – there are people who want to reverse all these social advances. I think this a terrible, colossal lie. Rich people will not gain from going back and making others poor. On the contrary, if we create better conditions for the poor, the rich will get more profits which in turn will benefit the middle class – and there will be more justice, better jobs, as well as less crime, illiteracy, and hunger in the country. I know that many people don’t like this idea. Many don’t want to accept the idea that just in 12 years we made higher education available to more people than they did in a 100. How could it be? How is it that in 12 years we opened more colleges where students can learn a trade than they did in a century? I cannot believe that a minister in the Brazilian government could say that by investing in education we spend too much. This is the best investment in the nation’s future that one could think of. And this kind of investment has a very quick return, which makes our country more competitive, improves the quality of our products, and enhances our performance. I have always thought that education is vital for the wellbeing of our country. And that’s why the only Brazilian president without a university degree, I am talking about myself, built most of the universities in this country. And I suspect that some people in the Brazilian elite don’t like this. RT: In your opinion, who does this movement report to? Many say that some external forces don’t want to see Brazil the social state that it was under the Workers’ Party government. Do you think there has been some outside interference? L: It’s possible. Look at what happened in Egypt or Turkey. There have been periods in Brazil’s history when external forces united against our country in order to stop it from becoming an international leader. I remember how Brazil surprised the G8 nations by holding the uranium talks with Iran. That would’ve been a much better deal than last year’s agreement signed by the US and Europe. But they could not accept our proposal because Brazil was not a global player. Brazil was not a leading nation. We could not play any significant role in international affairs, and that was very sad. Many didn’t like the fact the Brazil had become a global player with significant influence in Latin America. They didn’t like our country severing ties with the FTAA (Free Trade Area of the Americas) after Mercosur was established. L: And the Union of South American Nations, the Community of Latin American and Caribbean States, the IBSA (India, Brazil, South Africa) Dialogue Forum. Brazil has also taken part in top level meetings in South America, South Africa, and the Middle East. Many people did not like it. Imagine a party attended by only white people with blue eyes. And suddenly a Brazilian crashes the party. Of course he will not receive a warm welcome from everyone. I remember how President Chirac invited me to the G8 summit in Evian-les-Bains. The King of Saudi Arabia and Mexico’s President Fox were also there. Suddenly I saw a world I had never seen before. Here I was – surrounded by President Bush, Japan’s Prime Minister Junichirō Koizumi, Tony Blair, and Gerhard Schröder. And I thought to myself, I am just a lathe operator who used to work at a factory… It is incredible that I am part of this world now. I was so proud to attend that summit. All other national leaders had a far better education. They didn’t know anything about the working class which was my background. They had never been to a factory, lost a job, or lived in flooded streets. They had never woken up to discover waist-deep water in their house. They never knew hunger. And I went through all that. I was proud that even without a university degree I knew something they didn’t. I felt more comfortable thinking about the people I represented at that summit. I spoke for the voiceless. I spoke for those who couldn’t even dream of ever having a say in political matters or heading up a state. It was one of very few cases when a person of humble origin could rise to their level. I guess not everybody liked it. But Brazil began to receive invitations to the G8 summits. The G20 nations now took Brazil into account as well. I think some may not have liked it very much. I can’t really tell if there is external pressure, but maybe somebody will be able to figure it out in the future. RT: According to WikiLeaks, the current acting president was in contact with the US Embassy back in 2006, at the time of your presidency. L: I read about it. It so happens that many things come to the surface with delay. In any case, I’m convinced that Brazil is a great country with a great potential. And I believe that more often than not the government of Brazil missed out on its chance of success because of its erroneous idea that the United States can help everyone. Everyone wants to export to the US. But the US also wants to export its products. Everyone wants to export to China, but China is also interested in running exports. Everyone wants to export to Germany, but Germany also wants to export. So what kind of policy did we chose? We chose to look into the potential of our relations with other countries – to look at what can be done in relations between Brazil and Venezuela, Brazil and Angola, Brazil and Mozambique, Brazil and Argentina, Brazil and Peru, Brazil and Bolivia; to look at what we can do to unlock that potential; to see where we depend on each other and where we can be useful to each other. These are things that we made the foundation of our foreign policy. And it wasn’t only in the area of trade cooperation. We also need to approach our relations in terms of logistics, geopolitics, and participation in international forums. The current head of the World Trade Organization is from Brazil, the current Director-General of FAO (Food and Agriculture Organization of the United Nations) is also a Brazilian. That’s because we succeeded in working out a clearly-defined policy and win the trust of people. Brazil cannot afford viewing Cabo Verde, Bolivia, Nicaragua, and Mozambique as trade partners only. We need to acknowledge our historical debt to the African continent, which cannot be repaid with money, as it cannot be measured in money. Only our solidarity and readiness to share out the most advanced technologies can in some way make up for it. Thus, Brazil’s participation in construction of an antiretroviral drugs production facility in Mozambique is an example of our aspiration to repay our debt to the people of Africa for everything they did for our country for the 300 years of slavery. These are the principles that make up the foundation of our foreign policy, and they are completely at odds with the current minister’sofficial statement about his plans to strike up a bilateral relations deal with the United States. But will the United States accept all that Brazil is willing to export? The United States is looking to export itself, not to import. And it looks like our interim government fails to understand that, and that they still have to learn a great deal. RT: And I would like to ask you more of a personal question in conclusion of our interview. 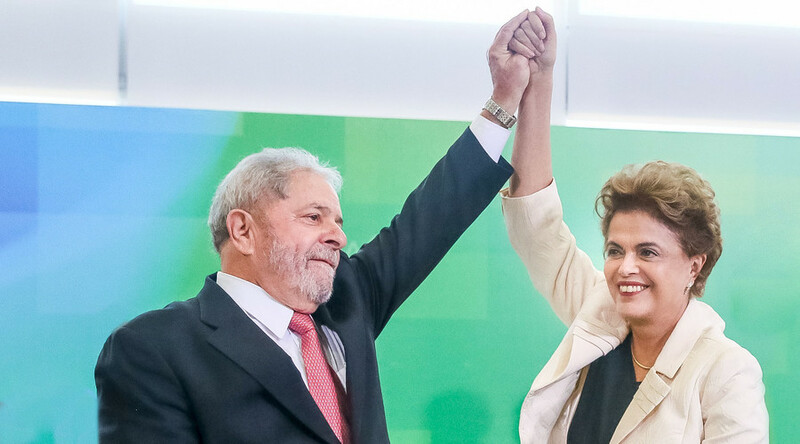 The next presidential election in Brazil is scheduled for 2018. Is there chance of us seeing you run for president? L: I would say it’s a yes and no; first of all, because I am not the only person involved in this decision-making. I am a member of a political party which consists of multiple movements, trade unions and civil society, and it’s the party that makes the decisions about our future actions. I do hope that we can prepare enough candidates ready to fight for this post. As for myself, to be honest, I would rather not run. I already served as president. I have had this experience, and I believe it was a positive one. I think we need new people at this stage. However, if there is anything that might encourage me to try again, my health permitting, it is the opportunity to restore the social integration project which is the best thing that happened to our country in the 21st century.